Now Spider was just as greedy as he was lazy. As soon as the young girl showed him the secret plums, his eyes became wide and his mouth began to water. Then, Spider shoved the little girl into the bushes. He rushed past her and climbed up into the tree. Then, he ate every single one of the plums. He didn't even leave one plum for the little girl. And, he didn't even say thank you! Finally, a smile crossed over the little girl's face and she said she would do as the spider asked. She cried for help as softly as she could, "Help! Help! 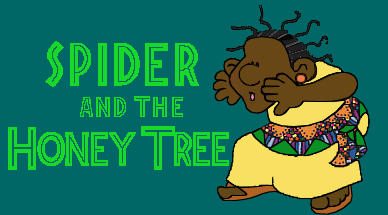 The foolish spider is caught inside the honey tree. Help! Somebody come and help this greedy spider!" Of course, nobody could hear her whispers for help. And, nobody could hear Spider's cries from deep inside the tree. They were too far into the bush where people rarely ever go. The little girl looked up at Spider with a clever grin. "Good bye, Spider, I am going to get some huge oranges for my family. If you want to eat some, just follow me there." She waved to him as she left to go down the trail.